Longline is the primary gear used to catch southern bluefin, and the majority of this catch is taken by Japan. Longline landings of southern bluefin in 2013 amounted to just over 2,000 t in the Pacific and 8,000 t in the Indian Ocean. Both the current health of the southern bluefin stock and the impacts of longlining gear on other species are of high concern. Southern bluefin tuna are large, pelagic predators capable of growing to over 2 m in length. They live exclusively south of the equator and are primarily found in the Indian Ocean between 30° and 50° S. This species has a high inherent vulnerable to fishing. Based on the 2014 stock assessment, abundance is very low and the southern bluefin stock is currently overfished; current exploitation rates are considered moderate. The management organization responsible for southern bluefin is the Commission for the Conservation of Southern Bluefin Tuna (CCSBT). Despite reducing catch quotas in recent years, extensive overharvesting in the 1960s and 1970s caused a decline in southern bluefin abundance, and the CCSBT has been unable to rebuild or maintain a healthy population of this species ever since. In addition, the CCSBT lacks transparency with regard to bycaught and discarded species and their bycatch management is currently ineffective. Pelagic longlines are a nonspecific fishing method. Bycatch in the form of other tuna, billfish, sharks, sea turtles, and seabirds occurs in high quantities. The non-target catch associated with the southern bluefin longline fleet includes several threatened or endangered species such as leatherback and loggerhead sea turtles, oceanic whitetip and silky sharks, and numerous species of albatross. Pelagic longlines have minimal impacts on the habitat as they rarely make contact with the seafloor. Nonetheless, the fishery catches large pelagic predators including other tunas, billfish, and sharks. The ecological impacts of removing these predators are not yet fully understood. Purse seines are the primary gear used to catch Pacific bluefin tuna in the Pacific Ocean. In 2012, 10,000 t of Pacific bluefin were landed with this gear, almost all of which were juveniles (i.e., immature fish that have not yet had a chance to reproduce). Longlines—the second most common gear—target older individuals; regardless of the gear used to catch them, almost all (>90%) Pacific bluefin tuna end up in the Japanese market, either by way of domestic catches, or through imports from other fishing nations. Pacific bluefin are large, pelagic predators capable of growing to over 2 m in length. They spawn in the north Pacific Ocean and undergo trans-Pacific migrations across from Japan to the coast of North America as they mature. This species has a medium inherent vulnerability to fishing and, based on the 2014 stock assessment, the stock is currently overfished with overfishing continuing to occur. Pacific bluefin tuna is co-managed by the Western and Central Pacific Fisheries Commission (WCPFC) in the west Pacific, and by the Inter-American Tropical Tuna Commission (IATTC) in the east. Currently, no target or limit reference points exist for this stock, and only two stock assessments have been conducted. Despite recent attempts to decrease annual catches, especially for juveniles, management has thus far been ineffective at managing the Pacific bluefin stock. Pacific bluefin are landed using unassociated purse seines, so the amount of bycatch they generate is much lower than that taken by other purse seines fisheries (e.g., those that use FADs). However, pelagic longlines are a nonspecific fishing method. Bycatch in the form of other tuna, billfish, sharks, sea turtles, and seabirds occurs in high quantities. The non-target catch associated with the Pacific bluefin longline fleet includes several threatened or endangered species such as leatherback and loggerhead sea turtles, as well as whitetip and silky sharks. All of these longlines have minimal impacts on the habitat as they rarely make contact with the seafloor. Nonetheless, the fishery catches large pelagic predators including other tunas, billfish, and sharks. The ecological impacts of removing these predators are not yet fully understood. Bluefin tuna have been severely overfished in all the world’s oceans. Bluefin tuna populations have been listed as Critically Endangered and Endangered on the IUCN Red list of threatened species. 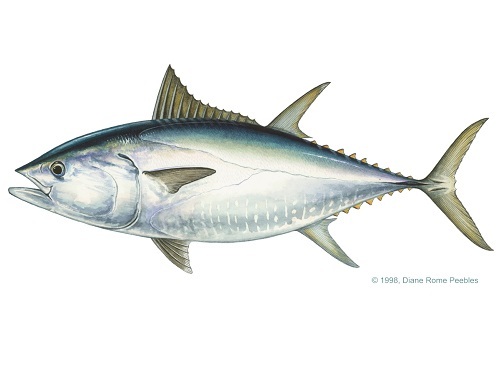 Bluefin are slower to mature than other tuna species and many individuals are captured before they have had a chance to reproduce. Atlantic and Southern Bluefin populations are overfished and the Pacific Bluefin population is being moderately overfished. All three populations have experienced severe declines and the stock status of all Bluefin tuna is considered to be of high concern. Management measures have been ineffective in stabilizing stocks and preventing the further decline of Bluefin tuna populations. Total allowable catches are set too high and often exceeded. Increases in minimum catch size have reduced high fishing mortality of juveniles but catch limits are still well above levels that can be sustained. Tuna longline fisheries catch high numbers of finfish, sea turtles, seabirds and marine mammals. Troll/poll fisheries have minimal bycatch. Little is known about the bycatch for Bluefin purse seine fisheries but it is thought to be moderate. Gear used in capturing Bluefin tuna has minimal habitat impacts. The removal of Bluefin tuna, a large predatory fish, may have a significant impact on marine food-web dynamics. Southern Bluefin tuna farms in Australia operate on a capture-based aquaculture practice. This means that the farms are 100% reliant on critically endangered wild tuna populations. Wild-caught juveniles of approximately 4 years of age are reared for 4-8 months before reaching market size. About 10-15lbs of whole, wild baitfish is needed to produce 1lb of Southern Bluefin tuna reared in Australia which represents a significant amount of stress on wild fish populations. All regions have the potential to produce significant environmental impacts due to untreated discharge from the land-based effluents. Pacific Bluefin tuna farms in Japan operate primarily on a capture-based aquaculture practice. This means that the farms are almost completely reliant on critically wild tuna populations that are vulnerable to the risk of extinction. About 3% of the annual Bluefin tuna production in Japan is sourced from hatchery-based stock. Yearling (age 0) and juvenile Bluefin tunas are caught in the Sea of Japan and reared for 1-4 years. About 15lbs of whole, wild baitfish is needed to produce 1lb of Pacific Bluefin tuna reared in Japan which represents a significant amount of stress on wild fish populations. Use of the antibiotic oxytetracycline, which is highly important to human medicine, has caused the development of antibiotic-resistant bacteria, which is a serious concern. Atlantic Bluefin tuna farms in the Mediterranean Sea operate on a capture-based aquaculture practice. This means that the farms are 100% reliant on threatened wild tuna populations. Individuals are reared or fattened for 2 months to 3 years. About 10-15lbs of whole, wild baitfish is needed to produce 1lb of Atlantic Bluefin tuna reared in the Mediterranean Sea which represents a significant amount of stress on wild fish populations. Pacific Bluefin tuna farms in Mexico operate on a capture-based aquaculture practice. This means that the farms are 100% reliant on threatened wild tuna populations. Wild-caught juveniles of approximately 2 years of age are reared for 3-5 months before reaching market size. About 15lbs of whole, wild baitfish is needed to produce 1lb of Pacific Bluefin tuna reared in Mexico which represents a significant amount of stress on wild fish populations. The California drift gillnet fishery targets primarily swordfish, with common thresher sharks being a secondary target species. The fishery incidentally catches shortfin mako shark, opah, Pacific Bluefin tuna and albacore tuna. The abundance of shortfin mako shark is unknown, which is a serious concern. Pacific Bluefin tuna are overfished. As gillnets are a non-selective method of fishing, the fishery catches a number of bycatch species such as sea turtles and sperm whales. Although management measures have reduced the number of sea turtles accidentally caught, regulations around sperm whale bycatch are no longer in effect. Gillnets do not typically damage habitat as they do not make contact with the ocean floor. Swordfish catches in California have declined from 1,413 mt in 1993 to a low of 62 mt in 2010.